From the time you walk into our showroom, quality comes first. We repair and refinish all makes of wheels. 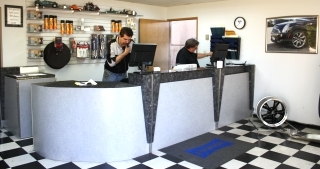 Our fully trained technicians will get your wheels back to 100% again. Our fully equipped state of the art facilities allow us to machine, weld, paint and polish wheels and no wheel leaves our shop without passing our rigorous quality control testing. Our diamond tooling lathes use superior craftsmanship to machine finish wheel faces. Factory finish painting and factory finish clear coating on machine faced wheels. Our modern fully equipped paint spray booth has a paint drying system using short wave infra red curing system. See the amazing results.